Hotel Arista weddings are pure class. From the upscale Grand Ballroom to the charming "living room" entry area to the sweet lighting in the bathrooms (seriously, check it out), this Naperville wedding venue has all the elegance of a boutique Chicago wedding venue - with some conveniences you just won't get anywhere else. Backthird Entertainment DJs and musicians have been working at Hotel Arista weddings since 2008 - and we keep pretty decent notes. Here are our DJs' tips about what wedding couples should - and shouldn't - do to get the most out of an Arista wedding. 1. 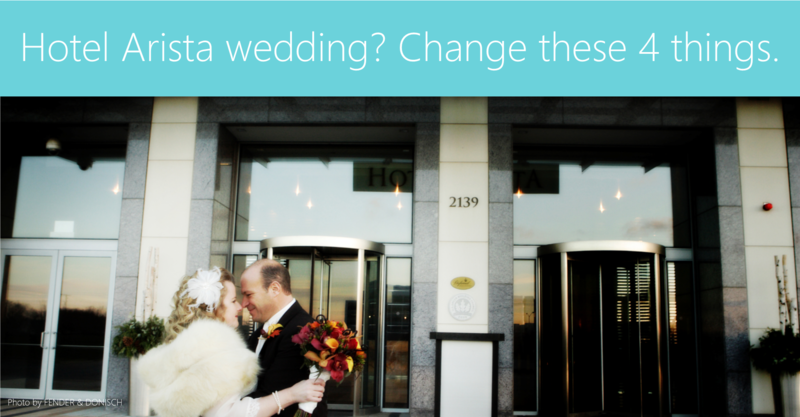 Change locations throughout the wedding. You have to build up to the ballroom. An Arista wedding typically takes place in at least two spaces - you'll have cocktails in a pre-function area, then enter the ballroom just before dinner. Planning a ceremony at the Arista or hoping to have a drink or game out on the patio? Your guests will be moving even more. That's a good thing - changing spaces keeps things fresh for your guests, and provides an opportunity for everyone to re-engage with one another and with the events of the night. And when the ballroom doors open for the first time to reveal your great decor or the sounds of a sweet jazz trio - well, let's just say it's memorable for everyone. When the agenda calls for a new space or a new event, our DJs like to recommend a new soundtrack as well. For example, if guests are moving from the pre-fucntion area into the Grand Ballroom at 7pm, shifting from jazz on the patio to an upbeat indie rock for dinner can emphasize that transition. New sights deserve new sounds. At Backthird, we often use live music to set apart different parts of your evening. For example, if a pop string trio is playing your cocktail hour outside the ballroom, you might use the quartet in the ballroom during dinner. Adding a fourth musician makes this bigger space sound bigger, too - and picking up the beat gets your guests gradually in the mood for dancing when your DJ spins later on in the evening. Even if you just use live music for one part of the night, or let your DJ do it all, it still makes sense to change up styles and genres as your party goes on. Wait, what? Yes, seriously – furniture in the Arista is NOT nailed down, which means the room setup you saw when you toured the hotel need not be the one you settle on for your own wedding. Take the advice of the Arista's staff on this one - the best ballroom orientation depends on which vendors you're using, how many guests you're having and - of course - your own taste. Don't be afraid to try new things here, as long as you've got expert help from Katie and her team. Speaking of expert advice, nobody knows what works at the Arista better than the hotel staff and the florists, designers, photographers and DJs who regularly work there. Envision YOUR wedding the way YOU want - but share your ideas with the vendors you trust most to make sure what you have in mind will really fly. Then, between the two of you, work out the best way to get what you want. Maybe your first idea is your best - but maybe not. A good wedding vendor will be able to take your ideas and make them better. Our job isn't to have personal ideas for your wedding for you - only you can do that. Our job is to take those ideas, and make it easier for you to live them out - and love them.